The International Colour Association (AIC) held the AIC Colour Conference (Interim Meeting) in Lisbon, 25-29 September 2018. Environmental visual literacy: Examining the roles of colour and contrast. This paper discussed the use of colour/contrast strategies for the built environment. The hypothesis being that specific colour/contrast strategies may have a positive impact on attention and improve environmental visual literacy. Colour interventions with purpose: Sydney | Australia. This paper reviewed recent colour interventions as well as buildings that feature colour aimed at encouraging and improving engagement, supporting orientation and wayfinding strategies, and assisting with the safe operation of daily activities. The conference had a packed schedule. Keynote speeches were delivered by leading academics, designers, artists and authorities on colour theory and application including: Professor Jose Luis Caivano, author and editor, University of Buenos Aires, Professor Byron Mikellides, author and editor, Oxford Brookes University, and architect Tomas Taveira. Presenters also included Karin Fridell Anter, Harald Arnkil, Fiona McLachlan, Margarida Gamito, Verena Schindler, Stephen Westland and Saara Pyykko. AIC-2018 – Information about AIC Colour Conference Lisbon is available here. AIC-2019 – AIC Colour Conference 2019 is to be held in Buenos Aires, Argentina, 14-17 October. AIC-2020 – AIC Colour conference 2020 (Interim meeting) is to be held in Avignon, France. AIC-2021 – AIC Colour Conference 2021 (AIC Congress) is to be held in Milan, Italy. 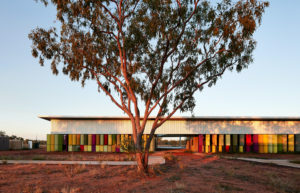 This image features the Fitzroy Crossing Renal Hostel, Central Australia, by Iredale Pederson Hook Architects.